A French coffee press with a minimalist design and polished chrome housing. Available in 3 cup & 8 cup size. The YORK from GROSCHE is an elegant and minimalist French coffee press. The flowing metal chrome design keeps the heatproof borosilicate glass beaker secure. It also allows you to enjoy the visual event of the brewing process. The YORK French coffee press is not only ideal for coffee and loose-leaf tea but also for blooming tea. With this elegant coffee and tea press, your coarse ground coffee or tea leaves will infuse in a few minutes. 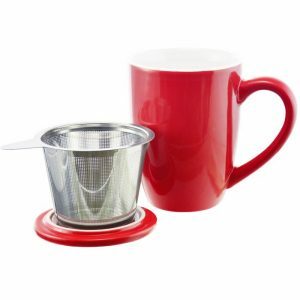 It’s available in two sizes: the 3 cup / 350 ml size makes one large cup of coffee or tea whereas the 8 cup / 1000 ml press makes two to three large cups. The YORK French press features GROSCHE’s dual filter system. All coffee grounds of tea leaves will stay in the press and won’t end up in your cup. The main filter is the press itself which is made from stainless-steel. You don’t ever have to worry about your press rusting or imparting any metallic taste into your drink. The other filter sits in the lid and acts as a secondary filter, keeping out any particles that came through the main press. The YORK coffee press comes with a large and comfortable soft-touch handle that lets you pour your tea or coffee easily. The French press is not just easy to use, but also much better for the environment than traditional coffee makers as it does not require any electricity or paper filters to brew your coffee or tea. You can clean the YORK tea and coffee maker very easily. It is dishwasher-safe, but we recommend hand washing the components in order to ensure a long life. GROSCHE is a Social Enterprise and a certified B Corp on a mission to do good in the world. For every product sold, GROSCHE creates 50+ days of safe drinking water for someone in need through the GROSCHE Safe Water Project. CONDITION NOTE: THIS PRODUCT IS BAND NEW AND UNUSED. IT MAY BE IN MISSING OR DAMAGED OR OUTDATED PACKAGING. IT MAY BE SHIPPED WITH OR WITHOUT EXTERNAL PACKAGING BUT INCLUDING ALL PARTS AND COMPONENTS. 350 ml / 11.8 fl. oz., 1000ml / 34 fl oz.